Paola Marizán reports on early and in-person-absentee voting. The Evansville election offices at the Civic Center open its doors last week for early and in-person-absentee voters. You can visit them from 8 am to 4 pm, Monday thru Friday. 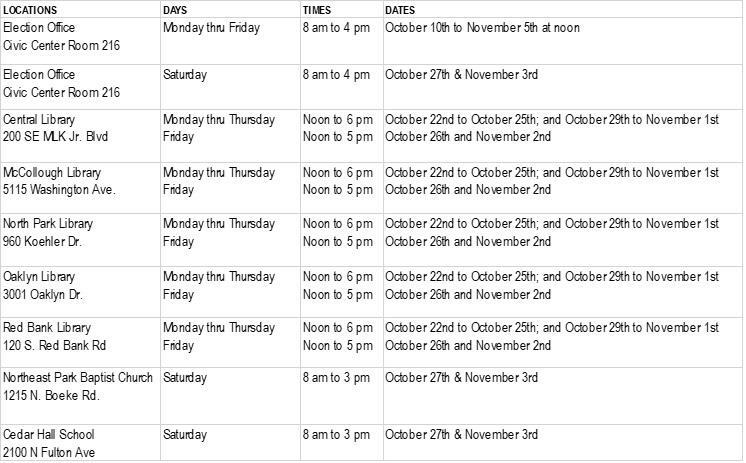 The Evansville Vanderburgh Library locations will accept early voting starting October 22nd to November 2nd. Monday thru Friday from noon to 6 pm and Saturdays from noon to 5 pm. Other locations only open on Saturdays will include Northeast Park Baptist Church and Cedar Hall School. Election Day is Tuesday, November 6th.